Beggars can’t be choosers. 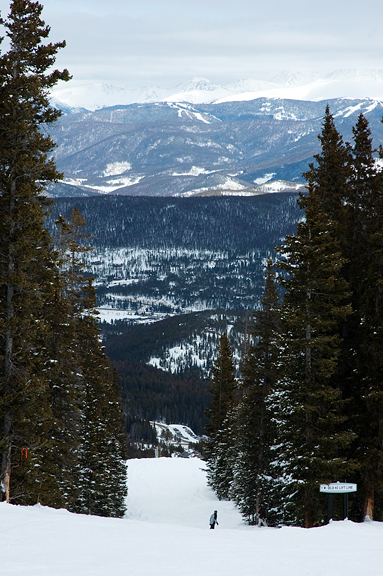 While it’s a lean year for snow in our part of Colorado, I really ought not complain. There haven’t been any “sick” or “epic” days to crow about, but at least I can ski. 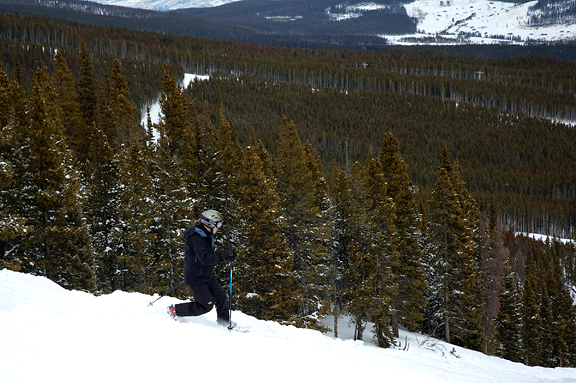 We’ve got the climate, the topography, and the big resorts. It’s embarrassing what I now consider to be a sub-par day. It’s a good feeling to be satisfied with something that isn’t perfect. Some people have accused me of being a perfectionist, but I am not. I don’t have the patience to be a perfectionist. I do have high standards and expectations when it comes to certain things, but perfection – no. About a year ago, I set out to reproduce a favorite biscuit that I could only get at home. These were called silver dollar biscuits from Crums Bakery in southern Virginia and they would sell out during the holidays weeks in advance because every good party must have silver dollar biscuits stuffed with thin slices of Virginia ham. you didn’t think i’d come back from virginia without some good old country ham, did you? I discovered that flaky southern buttermilk biscuits were NOT silver dollar biscuits. They were a different beast entirely. Some of my readers suggested different kinds of biscuits and the one that seemed the most similar to the silver dollar biscuits were angel biscuits. I searched for several recipes, bookmarked them, and promptly forgot about the biscuits. While I was in Virginia visiting my parents this month, they asked me if I wanted ham to take home. Ham. Ham is gold in Virginia. And when my parents refer to ham, they often mean a whole leg of country ham that is almost as big as my dog. As tempting as it was, I got a smaller 5 pound hunk of cooked Virginia ham. Of course, now that I’ve burned through half of it, I’m starting to regret not having taken a whole leg home :) With this precious stash in my refrigerator, I figured it was time to test out that angel biscuit recipe. The angel biscuit dough has both yeast and shortening. 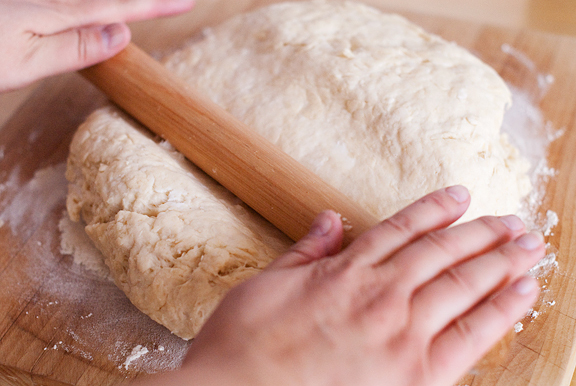 You only knead it 3 or 4 times and then roll the dough out for cutting. 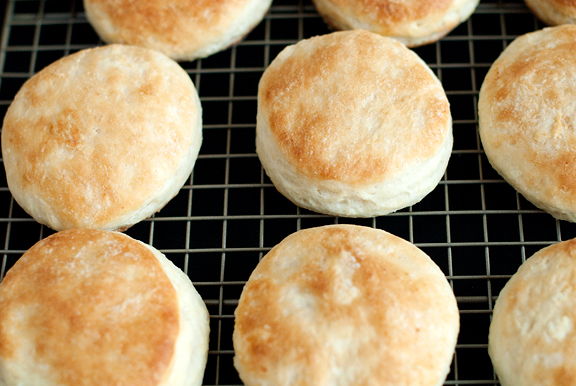 The yeast offers a texture that I prefer to the straight up buttermilk biscuits. The little blobs of shortening help to give it some flakiness too. I didn’t need to make any adjustments for altitude and it was pretty straightforward and easy to whip up a batch. 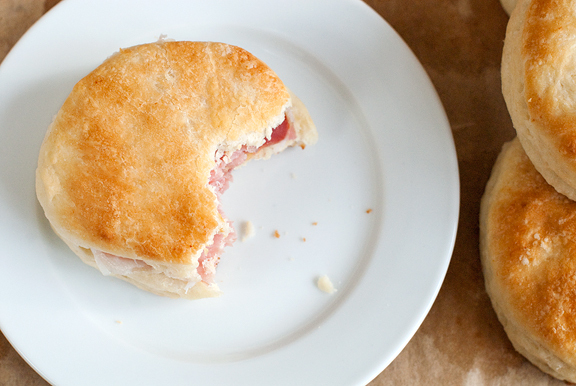 Overall, the biscuit is more tender with a hint of sweetness that pairs better with The Ham. 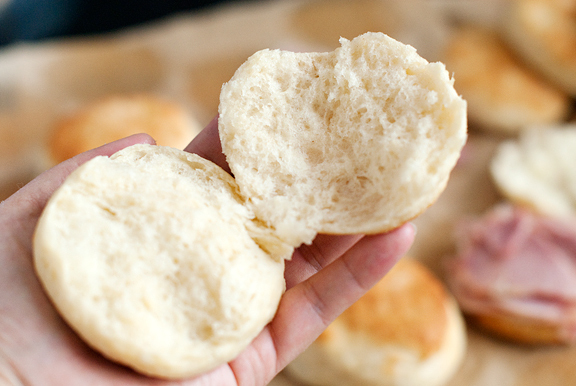 It is a cross between a soft dinner roll and a traditional buttermilk biscuit. These aren’t the silver dollar biscuits, but they are quite close and I’m satisfied with that. Now I just need to secure a steady supply of Virginia ham! Dissolve the yeast in warm water and let stand for 5 minutes. Stir in the warmed buttermilk and set aside. 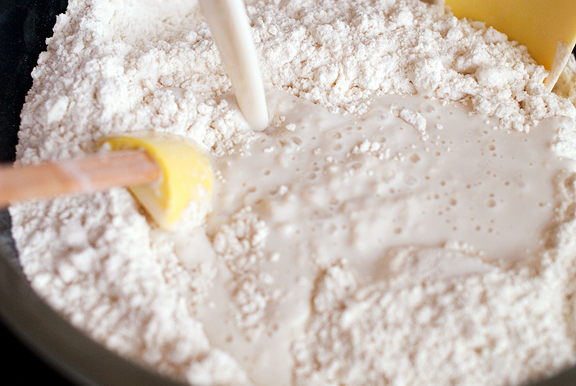 Combine flour, sugar, salt, baking powder and baking soda in a large bowl. Stir together. Cut in shortening with pastry blender until mixture resembles coarse meal. Stir in yeast/buttermilk mixture and mix well. Turn the dough out onto a lightly floured surface. 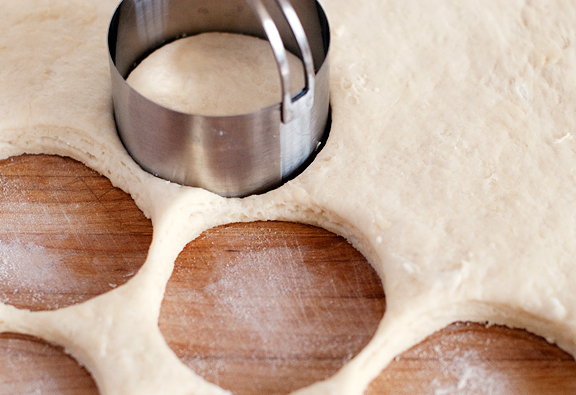 Knead the dough lightly 3-4 times, then roll out to about 1/2 inch in thickness. Cut with a biscuit cutter (I used 3-inch, but small ones would be great for appetizers – just roll them a little thinner or else they’ll be crazy tall). Place on parchment-lined baking sheet. Cover and let rise in a warm place for about 1 1/2 hours. Bake at 450°F for 8-10 minutes (9 minutes worked like a charm for me). Lightly brush the tops with melted butter (I skipped this). Makes about 30. That makes me really hungry. Will surely give them a try over the weekend and we’ll see about the pairing. Nothing better than ham and biscuits. Lovely. Ooh, the crumb on that biscuit looks so soft & pillowy as opposed to the usual craggy! 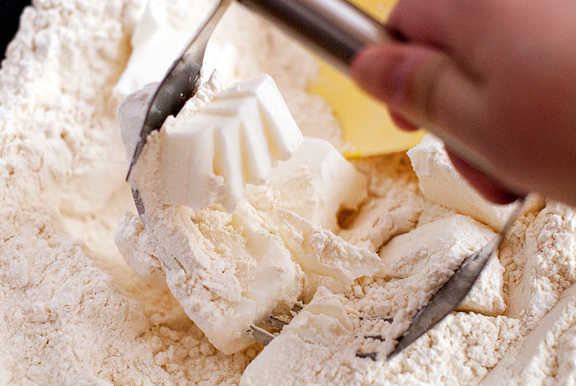 I think I’ve got a recipe or two for Angel biscuits stashed…must be time to make one, or yours. Check out virginiatraditions.com for some outstanding ham offerings from Edwards. I’m an ex-pat Virginian living in Colorado, and when I’m “jonesing” for tastes of home, that’s where I buy. Country ham on a warm biscuit and skiing? Perhaps there couLd BE no more wonderful marriage of things. That ham is making me drool. Being half Chinese and half German-American on top of growing up in a densely Italian-American area has ingrained in me a love for almost all pork products. Even from a distance I can appreciate and remember the taste of Virginia ham. Some people are unfortunate in that not only do they not have access to such goodies, they also have never experienced them. Fortunately, I am not one of them, and I’ve been blessed with opportunities to eat in various spots on the globe. As for skiing, I have not been so blessed. Campgaw mountain (if you went there you’d get out your magnifying glass and say WHERE is it? oh, you mean the little rock I just tripped over?) was the closest skiing facility to where I grew up, and it measures its elevation and its longest run in hundreds of feet. But that’s still better than where I live now. In this part of the midwest, the terrain is flatter than my chest. The good thing for me is that my favorite outdoor activities are running, hiking and riding horses, so I’m not pining for real mountains, although I do miss hiking in the little mountains of upstate New York. You live in a gorgeous place, and I’m glad you can appreciate it. Life is so much better that way, isn’t it? And I get to visit them vicariously through gorgeous blogs like this, and I certainly appreciate the time and talent behind them. Makes my life better too. The biscuits look delicious and I know how popular ham biscuits are here! I remember having Chef Scott Peacock’s version of this at Slow Food Nation in SF a couple years ago. The best biscuits I ever ate. And the way they paired with the sweet-salty ham was just incredible. Wow, they look so fluffly! I should NOT have looked at this on an empty stomach! Ham biscuits are one of the (few) perks to visiting my mother in law in Virginia. These look really good! Oh, man!! I saw these biscuits on foodgawker before seeing them on your site. They woke me up! YUM! Wonderful post and lovely blog. I have to try this biscuit recipe. One of the best things in life: biscuit + butter! These look wonderful! I just recently started making my own biscuits and it’s the most comforting thing to have on a weekend morning. I can’t wait to try your version! What a beautiful shade of golden yellow! Country ham and biscuits was my favorite breakfast when I was a kid, but I haven’t had it in ages! Thanks for the reminder–I’ll have to try this recipe and make my own! I’ve heard of “silver dollar pancakes”, but not biscuits? Can you please tell those of us from the south what that means to you? I think we need to try your recipe for the angel bicuits for our next pot roast recipe as they would serve a grand purpose for sopping up the gravy. Light and fluffy got me to pay attention here. 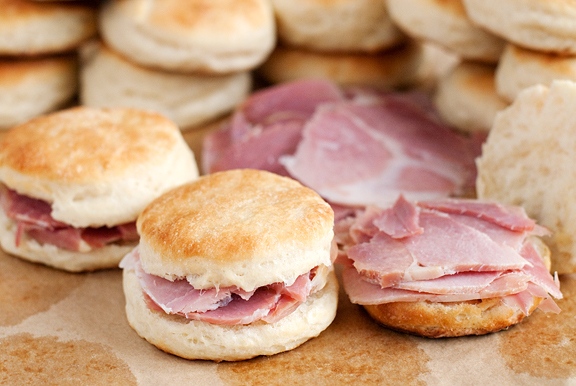 Lordy lordy, a good country ham biscuit is among my favorite things in the world! MMMmmmmmm, I can just imagine what they taste like with a little butter and raspberry or thimbleberry preserves! Omigosh! A gem from Taste of Home magazine! Back in mid-2000s it had devolved into a mix a bunch of nasty stuff together recipes. I’m glad to see it was once a great, truly homey publication. I see the search for silver dollar biscuits continues? In the meantime, those biscuits (and the ham of course, and something sweet for me ;) look plenty satisfying! You’ve made me wish I was back in Kentucky. When I visited there a number of years ago some of my favourite food memories were of biscuits and sausage gravy, country ham, grits and pancakes. I’m going to try these biscuits, they look amazing. I have the HARDEST time making biscuits, despite my Southern blood. In my family, angel biscuits are actually yeast rolls! Ohhh those look so good with the ham. Jealous of even your 5 pounds worth! What you made has attained perfection in my books and to me, I will be glad if I’m 75% as good as you are! I’m sorry for the lack of powder in your area! It must be disappointing! But, may the coming year be better! Mercedes – that sounds lovely! Carolyn – oh hon, I suggest you try them with salty Virginia ham :) No sweet in it at all, but it is soooooo good – I promise! Kate – oh!!! ;) at least there are a few perks – hee hee. I believe that Surry, VA is the heart of Ham in this world. I believe that “com’pny biscuits” are the best vehicle to serve some good fried country ham sliced translucent thin by your local variation of a straight razor. I believe I found you due to your hosting at TNS, and immediately loved your blog. Perhaps we can talk biscuits someday. I use lard for texture and consistency in my biscuit, and keep a tub of frozen lard (from locally raised pastured humanely slaughtered all natural no added hormones or antibiotics blah blah blah piggies) in my freezer. I also use unsalted butter in everything by default, or mix the two together rather than use shortening, though I’ve eaten many a fine biscuit by someone who did use the shortening. Feel free to email me to discuss other variations in biscuit recipes. I want to know more about Crums Bakery. Can I order biscuits from there and where is it at in south Virginia… I want to stop in! Kristin – Crums is no longer in business. I believe the daughter of the original Crums bakery baker is now selling the biscuits at Baker’s Daughter in Gloucester, VA. In looking up Baker’s Daughter on the Internet to get the phone number, it’s no longer in service. Hi! My inlaws live in F’burg, VA and we weren’t able to go back this year for Christmas. So we are staying home in CO. My father in law sent us a country ham that we cooked up yesterday and I am making the biscuits as we speak for a Christmas party tomorrow. They are resting right now. I will let you know how they turn out! Thanks for a great looking recipe!! They are absolute perfection. This is definitely my biscuit recipe! Thanks so much. Thanks for a great recipe. Since moving to Mexico City from Baltimore, MD I’ve met with challenges in the differences in baking at high altitude. Imagine my excitement when I saw that you didn’t have to make any adjustments to the recipe. I’m originally from Virginia and I have memories of this type of biscuit (paired of course, with Virginia ham). The photos made my mouth water. Sadly, Virginia ham is impossible to find here in Mexico, so I have to use Serrano ham as a stand-in. So is this the end of your biscuit adventures? Or is there more? I can’t find a search box on your site so I thought i’d just ask. I’m on the hunt for the perfect biscuit. I wish I knew what a silver dollar biscuit is so that I had a baseline to gage the rest of your biscuit experiments off of. Apron Appeal – there’s a search box at the top of the page. So glad you got to visit Virginia . Smithfield Va ham is what I love and try not to get it too often as I tend to want to eat way to much. Your biscuits are beautiful. Great looking and delicious biscuits! 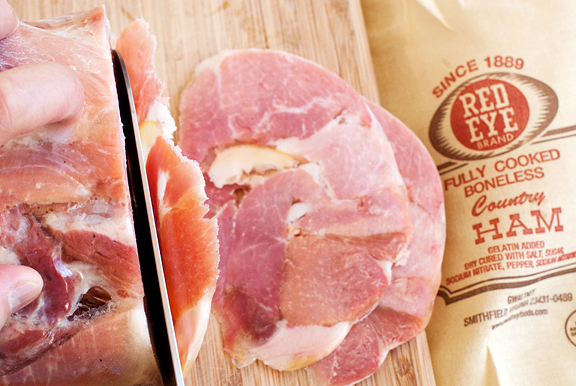 As for the ham, you may want to check out Kites Ham in Madison VA,(they have a website) they can ship anywhere. I’ve enjoyed there ham all my life and no others have compered yet. Hope you give them a visit. Thanks again for the biscuits! These may be a possibility for your quest.